Few days ago in Geneva Russia and the West completed an agreement on Ukraine crisis. Now is clear this agreement means absolutely nothing. That logically leads to a conclusion that Great World powers have already divided Ukraine into zones of influence and all negotiations are only a theater before these decisions go real. The most important decision that could change the situation is de facto unrealizable. 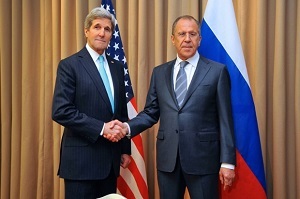 Russia and USA agreed to disarm all non-government militias and free the occupied government buildings. But only hours after the agreement both Kiev’s Maidan and Eastern Russian separatists refused to execute it. In fact if the agreement is to become reality this will mean an immediate crash of the new coup d’etat Ukrainian government. The biggest and most influential non-government militia is the one that belongs to the Right Sector – the same that removed previous president from power. The armed groups of this party first occupied The Maidan, then occupied some of government building and at the end occupied the Presidency and the Parliament. Even now the Parliament is working under the muzzles of Right Sector guns. This militia is the main supporter of the government itself. With official army and police in not very reliable condition, and some of them taking the side of Russia and separatists, the new government is de facto a government of the Right sector and is backed by its militia. They even created a new name – “national guard” – the classical legalization of unlawful revolutionary armed groups. Without these militias the government cannot survive. In addition we must not forget that Russia officially does not recognize the new government. So from Russian point of view a “de-occupation” of government buildings may also mean resigning of the new government and return of the last constitutional president that is now in exile in Russia. That was exactly what the East required – freeing the Maidan, disarmament of the Right Sector and resignation of the interim Prime Minister Yatseniuk. As all this did not happen, the East decided that the unlawful government in Kiev is not fulfilling the agreement and therefore they will not fulfill their part too. It is obvious the East cannot disarm while the Right Sector is still in full arms. It is good to remember how all this started to understand the reality. The last legally elected president Victor Yanukovich was a pro-Russian politician. He also got a majority in Parliament (Rada). So from every democratic point of view he was the lawful ruler of the country. He was also accepted as a protector of Russian minority in the East and in Crimea. After the Right Sector removed him from power, the Russian minority has lost his protector. They still recognize only him as President, and from constitutional point of view he is still in office. This is a very strong argument in their favor. But without Yanukovich in Kiev and removed by a coup, the Russian minority had both the fears to motivate and the excuses to start its separatist moves. In Crimea it was easy. They were almost ready to secede from Ukraine at any moment. All the police and army in peninsula were pro-Russian and there are many local militias ready to act at any moment. In East Ukraine is more complex. Although in many areas Russians are majority, there are too much Ukrainians there. There are fears among Russians, but not so ready militias like the ones in Crimea. And finally in the East is the stronghold of some Ukrainian oligarchs that now joined the new government and were send to get the things under control. Some of them become even local governors. Anyway it is obvious that an agreement to disarm militias and free building is non-executable. This means that nothing will follow and both sides will continue to blame each other for the failure. At the end Putin will annex Eastern Ukraine or at least will provide a super federalist constitution that will de facto convert the East and South into independent pro-Russian regions. The West will remain pro-USA and pro-EU oriented and that will be profitable for the West Global powers. In an extreme scenario it is possible even US forces to enter the West Ukraine, while Russians enter the East. Americans will disarm the Right Sector and Russians will disarm the Russian militias. And all will happen under a UN resolution or a bilateral US-Russia agreement. I think that is the real agreement that was worked out, and Geneva was only a temporary façade needed to win transition time.